The toll from the four-year civil war in Syria is clearly visible even from space, with satellite images revealing that 83 percent of the lights have gone out in the country since 2011. The satellite data – which compares Syria’s night landscape in 2011 to that of 2014, from 800 kilometers above earth – reflects a grim picture of the situation on the ground in Syria, according to researchers from China’s Wuhan University. “These satellite images help us understand the suffering and fear experienced by ordinary Syrians as their country is destroyed around them,” the lead researcher on the project, Dr. Xi Li, said in a statement. The study was supported by 130 international NGOs, and its results were presented simultaneously with the launch of a new campaign under the hashtag #WithSyria, a solidarity movement with the Syrian people on the ground. The images show that 97 percent of electricity has been cut off in Aleppo province, and 96 percent went out in Raqqa, a region under the control of the Islamic State (IS, previously ISIS/ISIL). The lights across Syria have been slowly dimming since the civil war began in 2011. The fighting has destroyed schools, hospitals and homes. 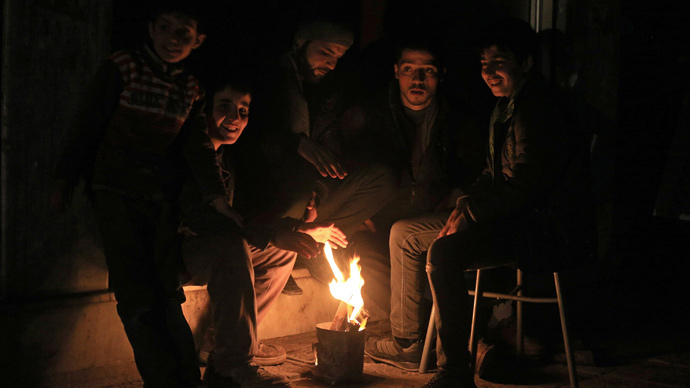 The Syrian government has been struggling with supplying electricity in light of the damages caused by violence, as well as the level of demand. The Syrian Ministry of Electricity and Energy in Damascus has condemned the “terrorist acts” of opposition militants that have damaged electricity infrastructure, including power stations. In February, Syrian Prime Minister Wael Halqi said the government will continue to subsidize electricity. “The government continues to subsidise staple food products, as well as the electricity sector,” Halqi told parliament. The Syrian war started with an uprising that broke out in the spring of 2011, following the Arab Spring protests and high-profile nationwide demonstrations against the government of President Bashar Assad. The conflict then grew into a full-blown war. Some of the radical Islamist groups that fought in the ranks of the opposition – backed by the West and Gulf States – have split to pursue their own agenda, hostile to both the Assad government and the so-called ‘moderate’ opposition. The conflict has claimed the lives of up to 295,000 people, according to February estimates from the UK-based Syrian Observatory for Human Rights. The United Nations Refugee Agency (UNHCR) estimates that almost 380,000 Syrians are in desperate need of resettlement. Meanwhile, Amnesty International projects that 5,000 people flee Syria every day under desperate circumstances – 75 percent of whom are women and children. A separate UN-backed study released on Tuesday showed a drastic decline in life expectancy, from 76 years in 2010 to less than 56 last year. UN High Commissioner for Refugees António Guterres said in February that Syria’s humanitarian crisis is the most dramatic the world has encountered for a long time. This April, Moscow is set to host a meeting between the Syrian opposition and representatives of the government in an attempt to find a political solution to the crisis.